S & C (1921) The 8 ton 34 foot gas screw S & C was destroyed by ice in the spring break up on the Taku River April 20, 1921. The vessel was hauled out on shore for winter and unoccupied. The S & C had a value of $2,000 and no insurance. S P #3 (1917) The 31 ton scow S P #3 stranded and was lost on Key Reef in Clarence Strait October 28, 1917. S S F CO NO 5 (1952) The 126 ton 70 foot wooden scow S S F Co No 5 foundered September 24, 1952 off of Narrow Point in Clarence Strait. SADIE (1961) The 10 ton 34 foot wooden gas screw fishing vessel Sadie foundered January 1, 1961 at Tee Harbor, Juneau. SAGINAW II (1945) The 92 ton 70 foot wooden scow Saginaw II foundered in 1945 between Slocum Arm and Khaz Bay. SAINT ANNA (?) The 26 ton 48 foot wooden gas screw fishing vessel Saint Anna collided with a rock and was lost in Johnson Cove near Lincoln Rock. The Saint Anthony had a value of $2,700 with no cargo. She was a total loss with no insurance. The passengers and crew were all rescued. SAINT CHRISTOPHER (1960) The 11 ton 29 foot wooden oil screw Saint Christopher stranded and was lost March 27, 1960 at Takaze (Takatz) Bay in Chatham Strait. The crew of the Saint Lawrence was assisted by the schooner North and all survived. The Saint Lawrence had a value of $3,500 and was a total loss as was her cargo of fish. SAINT LOUIS (1963) The 18 ton 41 foot wooden oil screw Saint Louis was consumed by fire May 8, 1963 at Juneau. SAINT MARTIN (1937) Fire destroyed the 36 ton 55 foot wooden gas screw Saint Martin in Wrangell Narrows at 6:00 a.m. April 23, 1937. The vessel departed Petersburg that day bound for Ketchikan with two persons on board and no cargo. Her engine caught fire across from Scow Bay Cannery in Wrangell Narrows. Weather at the time was calm, no wind and light snow falling. According to the casualty report, there were fire extinguishers on board but no time to use them. The Saint Martin was a total loss. The persons on board made it to safety. SAINT PAUL (1978) The troller Saint Paul struck a rock and sank August 12, 1978 near Elfin Cove and George Island northwest of Juneau. SALINTA (1979) Three adults and seven children were lost from the 33 foot Canadian gillnet fishing vessel Salinta which was found washed ashore at Tree Point December 5, 1979. The small old Canadian fishing vessel had departed Prince Rupert December 2nd on a day trip to Portland Inlet. The heavily damaged vessel washed ashore 46 miles northwest of Prince Rupert. There were no survivors. Lost were Roy Mostad (44), his three children Tommy (13), Robert (9), and Tina (9), Judy Stevens (30) and her three children Lyle (7), Nadine (6), and Roselle (4), and Wendy Stevens (27) and her daughter Angie (4). The Sally B had a value of $5,000 and was a total loss. There was no cargo but the passengers and crew lost all of their personal effects. There was no loss of life. The vessel was insured for $4,000. SALMON MULE (1956) The 40 ton 52 foot steel oil screw Salmon Mule foundered August 25, 1956 approximately 10 miles offshore from Ocean Cape in the Gulf of Alaska. SALOME (1951) The 14 ton 36 foot wooden gas screw fishing vessel Salome foundered September 13, 1951 at Tyee. SALVAI (2003) The 36 foot salmon troller Salvai sprung a plank and sank February 19, 2003 on the north side of Kupreanof Island near Wrangell. Both crewmembers abandoned ship to a skiff and made it to a nearby beach where they built a fire to keep warm. They didn’t have time to issue May-Day but fortunately a U S Coast Guard Helicopter from Sitka spotted them the following morning and hoisted both to safety. SAMOKE (2004) The 45 foot steel fish tender Samoke was consumed by fire August 20, 2004 at Legma Island south of Sitka and west of Goddard. The fire originated in a stove. Both crewmembers abandoned ship to the beach and were picked up by the fishing vessel Allure and transported to Sitka. SAMSON (1923) The 11 ton 33 foot wooden gas screw fishing vessel Samson caught fire and was lost at Cape Augustine, Dall Island at 9:00 a.m. Sunday August 19, 1923. The vessel departed Sitka August 12th for sea fisheries with three crewmen on board. The vessel had 10 tons of fish, ice, bait and gear aboard with a value of $1,000 when the fire began. The cause of the blaze was unknown. The Samson became a total loss along with all cargo. No lives were lost. The vessel was insured for $3,000 but the cargo was not covered. SAMSON II (1965) The oil screw Samson II was consumed by fire August 1, 1965 three and a half miles north of Sitka. SAN MARTIN (2000) The 48 foot wooden salmon fishing vessel San Martin was consumed by an engine room fire and lost August 19, 2000 at Polk Island southwest of Ketchikan. All four crewmembers made it to safety. SAN TOY (1967) The 10 ton 29 foot wooden gas screw fishing vessel San Toy foundered April 16, 1967 in Chomly Sound. SANCE (1940) The seiner Sance collided in heavy fog with the cannery tender Spencer and sank July 11, 1940 in Wrangell Narrows. The seiner was nearly cut in half and sank in five minutes. The Spencer rescued the crew of the Sance and transported them to Wrangell. SANCO (1956) The 15 ton 40 foot wooden gas screw fishing vessel Sanco burned September 8, 1956 due east of Round Point Light, Zarembo Island, one quarter mile from Etolin Island. SAND PEBBLE (1986) The cabin cruiser Sand Pebble grounded and was lost March 26, 1986 on Low Island in Sitka Sound. Of the five persons aboard the Sand Pebble, three were lost in the disaster. The vessel was traveling from a mine on Chichagof Island to Sitka. SANDRA L (2016) The fishing vessel Sandra L grounded and sank October 27, 2016 at Frosty Reef, Koka Island Passage in Sitka Sound. The Sandy, valued at $2,500, was a total loss along with all but six 10 gallon kegs of illicit liquor. Those were taken by customs and prohibition officers. There were no lives lost. SANTA RITA (1940) The 15 ton 48 foot wooden oil screw fishing vessel Santa Rita was destroyed by fire November 19, 1940 two miles south of Baranof. The only person aboard made it to safety. SARAH MARIA (1988) The 42 foot longline fishing vessel Sarah Maria ran onto the rocks and was destroyed October 3, 1988 at Big Branch Bay on the southwest shore of Baranof Island. Only one of four crewmembers survived. The sole survivor was the only one able to don a survival suit and swim to shore. He was picked up on Beavertail Island by a U S Coast Guard Helicopter. Lost were Robert Roy Tenney, Donald Paul Tenney and John Michael Glaab. SCHCOLD (1914) The purse seine fishing vessel Schcold was lost in Frederick Sound in 1914. The vessel was worth $7,000 with cargo at the time of the loss. SCHORN (1934) The 29 ton 46 foot wooden oil screw fishing vessel Schorn foundered at Key Reef in Clarence Strait November 7, 1934. The five crewmen aboard made it to safety. SCOTER (1949) The USF&W Service vessel Scoter went on the rocks and was lost September 19, 1949 in Slocum Arm. SCOTER (1970) The gas screw Scoter was consumed by fire September 18, 1970 off of the southeast end of Spoon Island. Warren Wilkins, master of the Scout, and crewman A J Young tried to extinguish the blaze with Pyrene. The Scout, valued at $4,000, became a total loss. She was insured for $2,400. There was no cargo and no loss of life. SEA BEAR (2007) The fishing vessel Sea Bear stranded April 26, 2007 near Klag Bay on Chichagof Island. The crew of three abandoned ship to a skiff and was rescued from the shore by a U S Coast Guard Helicopter. SEA BIRD (1909) The tug Sea Bird was wrecked off Ketchikan and became a total loss in March of 1909. There was no loss of life. SEA BIRD (1929) SE Fire destroyed the 12 ton 35 foot gas screw fishing vessel Sea Bird at 1:30 a.m. May 28, 1929 at Cape Strait. The vessel departed Petersburg that morning bound for Cape Ommaney with one person aboard. A backfire from the carburetor set the Sea Bird ablaze. The survivor was plucked from the water by the gas screw Betty. The Sea Bird had a value of $4,000 of which all was lost. She was insured for $3,000. There was no loss of life. SEA BREEZE (1920) The 8 ton 35 foot gas screw fishing vessel Sea Breeze was destroyed by fire in Sumner Strait August 25, 1920. Two of her three crewmen died in the disaster. Lost were W R Woodworth, master of the Sea Breeze, and crewman J Close. The vessel had departed Ketchikan bound for west coast canneries. They had reached “Yasha Island, Sumner Strait” when the vessel caught fire. The Sea Breeze was valued at $1,500 and was a complete loss with no insurance. SEA FOAM (1964) The 49 foot wooden oil screw fishing vessel Sea Foam was lost after colliding with a barge in southeast Alaska September 24, 1964. SEA GRAM (1953) The 13 ton 41 foot wooden gas screw fishing vessel Sea Gram burned October 25, 1953 at Saltery Bay in Tenakee Inlet. SEA GULL (2001) The 30 foot fishing vessel Sea Gull swamped while hauling nets in heavy seas and capsized August 19, 2001 at Point Marsden near Hawk Inlet, Admiralty Island. All six crewmembers were rescued by the fishing vessel Steadfast. SEA IT (1946) The 17 ton 45 foot wooden oil screw Sea It foundered December 7, 1946 off of Point Adolphus. SEA KING I (1982) The 82 foot tug Sea King I sustained damage and sank December 27, 1982 in Aurora Basin, Juneau. The Sea Light had a value of $3,000 and was carrying a cargo of 2 tons of fresh fish worth $200. The cargo was lost, but the vessel was salvaged and returned to service. It is included in this compilation as evidence of the wreck may still be on site and of interest. The Sea Lion II had a value of $6,000 and was a total loss. There was no cargo onboard. She was insured for $4,000. There was no loss of life. SEA MAID (1991) The 36 foot troller Sea Maid flooded and sank September 13, 1991 off of Cape Edgecumbe. A leaking stuffing box or loose plank may have caused the disaster. The Sea Otter was valued at $1,400 and was a total loss. There was no insurance on the vessel and she was not carrying cargo. There was no loss of life. SEA SHELL (1950) The 11 ton 33 foot wooden oil screw fishing vessel Sea Shell was destroyed by fire January 21, 1950 at Gambier Point on Admiralty Island. SEA VAMP (1984) The fishing vessel Sea Vamp capsized and sank March 29, 1984 near Sitka. SEAFARER (2009) The 58 foot wooden purse seiner Seafarer flooded and sank April 17, 2009 in Clarence Strait seven miles north of Thorne Bay near Narrow Point. The Seafarer was on her way to Thorne Bay with five crewmembers on board when the disaster occurred. All crewmembers were able to escape to a skiff as the vessel flipped on her side and sank in 250 fathoms of water. Rescue efforts by the U S Coast Guard were greatly enhanced because the crew of the Seafarer took the vessel’s EPIRB and a flashlight with them in the skiff. The loss of the Seafarer was attributed to catastrophic hull failure. SEAL (1887) The small steamer Seal was lost in Lynn Canal north of Berners Bay March 20, 1887. 12 persons were lost in the disaster. The vessel was said to be travelling from Juneau to Dyea with passengers, freight and mining gear. SEEKUM (1939) The 12 ton 35 foot wooden gas screw fishing vessel Seekum stranded and was lost near Sitka November of 1939. The one person aboard was lost with the vessel. The Sehome had a value of $1,200 and was reported as a total loss. Her cargo of personal effects and tools valued at $400 were also lost. Neither the vessel nor her cargo was insured. There was no loss of life. SEHOME (1906) The 11 ton 38 foot wooden schooner Sehome stranded and was lost with all hands October 26, 1906. Lost with the Sehome were Ole Neilson, Paul Jacobson and John Engy. The vessel departed Petersburg on a fishing trip to Frederick Sound. The disaster occurred at Point Gardner on Admiralty Island. Winds were high and southeasterly. The Sehome had a value of $600. SELDOVIA (1928) The 144 ton fishing scow Seldovia foundered October 17, 1928 on Barren Island. The Senator was a total loss along with her cargo. The vessel was valued at $13,500 and her cargo of fish at $100. She was insured for $7,000. There was no loss of life. SENORITA (1898) The sloop Senorita disappeared in the north Pacific in 1898. She departed Seattle for Juneau with seven men aboard February 1, 1898. Thomas Farmer of Milwaukee WI and Frank McClain of Glendive SD were two of the lost crewmembers. SEPTEMBER SONG (1997) The 33 foot longline cod fishing vessel September Song plugged her scuppers with fish, flooded and sank November 20, 1997 southwest of Baranof Island. Both crewmembers made it to safety. SESLIN (1884) The 20 ton schooner Seslin stranded on a hidden rock and was lost near Howkan, Long Island May 1, 1884. The vessel departed San Francisco April 28, 1883 for a fishing cruise in northern waters with three crewmen aboard. The Seslin was valued at $800 at the time of the casualty. No lives were lost. SHANGRI-LA (1950) The 8 ton 31 foot wooden gas screw fishing vessel Shangri-La burned April 12, 1950 travelling from Sitka to Pelican. SHARYN A (1992) The 40 foot salmon troller Sharyn A grounded, made repairs, but sank in spite of them September 2, 1992 approximately 30 miles southeast of Ketchikan. There was no loss of life. SHIRLEY (1919) The 1,049 ton barge Shirley was abandoned at Skagway in 1919. The vessel was brought out of retirement during the gold rush of 1898. Investors from Tacoma had the vessel towed from there to Skagway full of paying miners and supplies during the gold rush, and then used as a floating hotel. The Shirley had been built as a bark in 1850 in Medford, Massachusetts. SIERRA MADRE (1988) The 58 foot fishing vessel Sierra Madre sank in three foot seas January 8, 1988 off of Cape Decision. All three crewmembers jumped into the water and swam over to the fishing vessel Rachael Pauline. SILVER WAVE (1940) The 20 ton 41 foot wooden gas screw fishing vessel Silver Wave was destroyed by fire on the cannery dock at Wrangell July 22, 1940. The six crewmen aboard made it to safety. SISU (1962) The 11 ton 32 foot wooden gas screw fishing vessel Sisu foundered September 14, 1962 at Swanson Harbor, southeastern Alaska. SITKA (1875) The schooner Sitka was driven ashore and wrecked near Wrangell September 20, 1875. The vessel departed Sitka April 5, 1875 bound for Hootzenoo. SITKA (1898) The 17 ton two masted fur sealing trading schooner Sitka was lost off of Cape Ommaney March 30, 1898. Her three crewmen perished with the vessel. The Sitka was last seen in Redfish Bay. She departed out of Sitka and was bound for Ft Wrangell. Her masts were picked up by the schooner Northern Star. The Sitka had a value of $800. SITKA (1935) The 74 ton 73 foot wooden oil screw Sitka struck a rock in Clarence Strait at 5:15 a.m. October 3, 1935. The Sitka departed Ketchikan the day before and was bound for Juneau with 11 crewmen aboard. She was carrying a cargo of 1,500 pounds of general merchandise. The vessel struck a rock near Narrow Point in Clarence Strait. The tide was ebbing and there was a thick fog. The Sitka was valued at $15,000 and damage to the vessel was $1,200. She was assisted off the rock by the gas screw St Nichols. SITKA (1969) The fishing vessel Sitka stranded and burned on the beach January 31, 1969 seven miles 200 degrees true from Point Astley near the entrance to Holkham Bay. SKAGWAY (1929) The 1,838 ton steam ship Skagway burned at Tatoosh Islands December 15, 1929. There were 27 persons on board but no lives were lost. SKAGWAY HELEN (1974) The gillnetter Skagway Helen burned from a fire caused by a faulty cook stove July 24, 1974 in Lynn Canal near Haines. SKIP (1906) The 16 ton wooden scow Skip stranded and was lost at Mount Andrew at 2 a.m. September 22, 1906. The scow had been tied at the wharf but her lines parted during the night. Winds were high and seas heavy when the vessel stranded and was broken up. Her reported value was $200. The Skip was a total loss with no insurance. No lives were lost. SKYLO (1988) The 42 foot longline fishing vessel Skylo swamped and sank October 4, 1988 two miles offshore south of Cape Cross. A series of 42 foot waves washed over the stern of the vessel which had a full load of halibut. All three crewmembers donned survival suits and abandoned ship. They were rescued eight hours later by a U S Coast Guard Helicopter. SLAYER (2006) The 32 foot troller Slayer foundered March 12, 2006 on a trip from Kake to Sitka to offload approximately 12,000 lbs of freshly caught gray cod and rockfish. A mayday was heard indicating that the vessel was sinking with two persons on board four and a half miles south of Point Gardner. A survival suit, life ring and partially deflated zodiac were all that was found. Lost were Richard Nebert (42) of Juneau and Matthew Moore (18) of Sitka. Weather included 8 to 10 foot seas and winds gusting to 50 knots. The Slayer had her rudder fall off three weeks before in Peril Strait when a weld broke on her rudder post. SMILE (1961) The 8 ton 31 foot wooden gas screw fishing vessel Smile was consumed by fire September 11, 1961 off of Alaska Packers Association north of Wrangell Island. SOMEHOW (1946) The 14 ton 33 foot wooden gas screw fishing vessel Somehow was consumed by fire July 14, 1946 in Elfin Cove. SONDRA LEE (1947) The 296 ton 99 foot wooden oil screw Sondra Lee burned March 9, 1947 in Wrangell Narrows. SOPHIE (1949) The 8 ton 29 foot wooden gas screw fishing vessel Sophie foundered June 5, 1949, 1,000 yards west of Point Amelia. SOUND (1967) The gas screw Sound burned December 30, 1967 at Steamboat Bay, Noyes Island. SOUTHERN (1944) The 18 ton 40 foot wooden gas screw Southern was consumed by fire at Hoonah June 12, 1944. SOUTHLAND (1972) The oil screw Southland stranded and was lost September 5, 1972 in Berners Bay near Point Bridget. The Souvenir had a value of $7,500 and was a total loss. There was no cargo on board. The vessel was insured for $3,100. No lives were lost. SPENCER II (1989) The 48 foot longline fishing vessel Spencer II grounded and sank March 5, 1989 in Port Houghton, Stephens Passage. All crewmembers made it to safety. SPIRIT (1983) The crab fishing vessel Spirit was found submerged at Pleasant Island near Gustavus December 3, 1983. The two people lost in the disaster were Larry Rebo (25) of Tenakee and Tracy Anderson (22) of Sitka. SPIRIT OF KWANTLEN (2000) The 35 foot sailboat Spirit of Kwantlen went adrift in foul weather, flooded and sank July 21, 2000 approximately 60 miles west of Sitka. The vessel was on a trip from Sitka to Victoria, BC when she encountered a storm which damaged her sails and subsequently experienced engine problems. All three persons on board were rescued by a U S Coast Guard Helicopter. SPOKANE (1917) The steamer Spokane became a total loss at Farallon Bay, N E Dall Island in 1917. The Sprat had a value of $1,000 and was a total loss. There was no insurance on the vessel. There was no loss of life. The Spray was valued at $3,000 and was a total loss. There was no cargo aboard. The crew made it to safety. SPRAY (1964) The 8 ton 31 foot wooden gas screw fishing vessel Spray was consumed by fire September 30, 1964 at Juneau. SPRING (1981) The 42 foot troller Spring flooded and sank September 14, 1981 two miles off of Ratz Harbor off of the northeast coast of Prince of Wales Island. The Standard had a value of $4,000 with no cargo on board. She was a total loss but was fully insured. There was only one person aboard at the time of the disaster. No lives were lost. STANLEY (1938) The 22 ton 40 foot oil screw fishing vessel Stanley foundered in Chatham Strait at 6:00 p.m. Sunday July 3, 1938. Bert A Vig, master and owner of the Stanley, was the only one aboard at the time. He had departed Port Alexander that day bound for Snipe Bay with no cargo. There was no wind and seas were calm. The Stanley foundered between Poorman’s Point and Wood (Wooden) Island in Chatham Strait. The cause of the sinking was not known. The oil screw Mars came to the assistance of the Stanley. The Stanley, valued at $6,000, was a total loss with no insurance. There was no loss of life. STANWOOD (1954) The 78 ton 58 foot wooden oil screw Stanwood stranded and was lost August 7, 1954 after striking a log near Petersburg. The Star had a value of $2,000 and no cargo. There was also no insurance on the vessel. No lives were lost. STAR NO 70 (1973) The 39 ton 61 foot wooden gas screw Star No 70 foundered May 24, 1973 at the South Arm of Chomley Sound, Prince of Wales Island. STAR NO 74 (1965) The 39 ton 61 foot wooden barge Star No 74 was destroyed by a storm during October of 1965 at Old Sitka (Mikhailovsk). STARLIGHT (1956) The 14 ton 39 foot wooden gas screw fishing vessel Starlight stranded and was lost October 23, 1956 on the west side of Golf Island. STARLING (1991) The fishing vessel Starling sank from deteriorating wood while tied to a barge April 4, 1991 in Gastineau Channel. The State of California struck an uncharted rock at 8:27 a.m. and by 8:30 a.m. there was nothing left of the vessel. The area of impact was filled with only wreckage and the struggling passengers and crew of the steamer. Many drowned in their staterooms and others were crushed by the wreckage. STELLA (1967) The 9 ton 31 foot wooden gas screw fishing vessel Stella burned November 6, 1967 at Carroll Inlet. STELLA (2006) The 58 foot steel seiner Stella stranded and was lost July 7, 2006 on Gull Island northwest of Juneau. The crew of three was rescued from their life raft by the Alaska Marine Highway Ferry Taku. The operator of the vessel was sleeping at the wheel when the vessel ran aground. Extensive hull damage resulted in rapid flooding. STRANGER (1927) The 9 ton 42 foot wooden gas screw fishing vessel Stranger stranded and was lost in a storm at the southern entrance to Rocky Pass at 11:30 a.m. October 26, 1927. The vessel departed Ketchikan October 25, 1927 bound for Kake. There were 4 crewmen aboard and no cargo. The strong gale and misty and heavy seas contributed to the disaster. The Stranger had a value of $3,000 and was a total loss with no insurance. There was no loss of life. SU-CE-K (1999) The 44 foot cement salmon troller Su-Ce-K was consumed by fire and sank in 50 fathoms of water June 30, 1999 near Sitka. The blaze was electrical and started in the engine room. It was put out once by the crew but reflashed and engulfed the entire vessel. Both crewmembers abandoned the Su-Ce-K and were rescued by the fishing vessel Destiny. The Success had a value of $4,000 and was a total loss with no insurance. There was no cargo aboard and no lives were lost. SUEMEZ (1933) The 26 ton 42 foot gas screw fishing vessel Suemez caught fire and became a total loss November 17, 1933 at Waterfall. SUKIE (1959) The 20 ton 40 foot wooden oil screw fishing vessel Sukie burned September 10, 1959 in Duncan Canal. SUMAQU (1998) The 105 foot fish tender Sumaqu burned and sank April 16, 1998 in Chatham Strait near Tenakee Springs. A waste oil bucket tipped while changing fuel filters and volatile fuel splashed onto a space heater igniting the blaze. The fire quickly spread to a paint locker and consumed the vessel. Both crewmembers were able to escape to safety. SUMNER (1916) Three crewmen were washed overboard and lost from the 61 foot wooden gas screw halibut schooner Sumner December 3, 1916. The vessel was about 30 miles off of Cape Ommaney on her way from Sitka to Puffin Bay with a crew of 14 aboard. Lost were Ovin Johansen, Ira Wood and Ole Haren. The disaster occurred during the evening of December 3rd with an 80 mile an hour gale blowing with heavy snow and unusually strong tides. Much fishing gear and other equipment was lost with the three men. The Sumner had a value of $2,700 and had no cargo. She had insurance for $1,500. There was no loss of life. SUN TOY (2005) The 28 foot “live-aboard” vessel Sun Toy was destroyed by fire June 28, 2005 in Thomas Basin, Ketchikan. There was no one aboard at the time of the fire. SUNBEAM (1940) The 8 ton 33 foot wooden gas screw fishing vessel Sunbeam foundered October 25, 1940 on the Three Hill Island side of George Island in Cross Sound. There were two persons aboard, one of whom was lost with the Sunbeam. SUNBEAM (1963) The 58 ton 62 foot wooden oil screw fishing vessel Sunbeam stranded and was lost July 17, 1963 near Point Gardner. The Sunny Point was valued at $5,000 with no cargo aboard. She was insured for $3,500. There was no loss of life. SUPERBA (1914) 15 of 23 persons on board were lost when the gasoline launch Superba capsized in heavy weather traveling from Skagway to Juneau in Lynn Canal July 4, 1914. The Superba was transporting people to Juneau for the 4th of July celebrations. The launch departed Skagway and had traveled 15 miles south when a freshening southerly gale forced them to turn around and head back north. The following seas overwhelmed the small vessel two miles south of Skagway and she capsized. Lost were Oscar Carlson of Seattle, Robert Saunders of Seattle, Monte Prince of Haines, Thomas Donovan of Haines, Myrtle Burlington of Haines, Henry Bernhofer of Skagway, Stantry Dillon of Skagway, Joseph Logan of Skagway, John Bell of Whitehorse YT, Sam Radowich of Whitehorse YT, Mr Lynch, Otis Oaks, P Monturian and two others. SUPREME (1953) The 7 ton 33 foot wooden gas screw fishing vessel Supreme foundered May 9, 1953 at the Thomas Basin Float in Ketchikan. SUSAN ANN (2004) The 58 foot wooden seiner Susan Ann flooded from her engine room and sank October 17, 2004 near Catherine Island in Chatham Strait. Both crewmembers donned survival suits and escaped to a skiff. A rescue boat from Chatham Cannery and HH-60 helicopter from Air Station Sitka responded to the vessels call for assistance. The rescue boat transported the survivors to a nearby beach where they were picked up by the Coast Guard helicopter. Salvage was under consideration but the vessel sank in 33 fathoms of water making it unlikely. SVEA (1941) The 8 ton 29 foot wooden gas screw fishing vessel Svea stranded and was lost on the easterly shore of McLean Arm January 25, 1941. The two persons aboard made it to safety. The Swallow had a value of $3,000 and was a total loss. She had no cargo aboard. There was no loss of life. SWAN (1915) The gas powered fishing vessel Swan disappeared after leaving Juneau bound for Yakutat in November of 1916. Missing with the Swan were her three man crew; George Young, Thomas Martin and Robert Fulton. 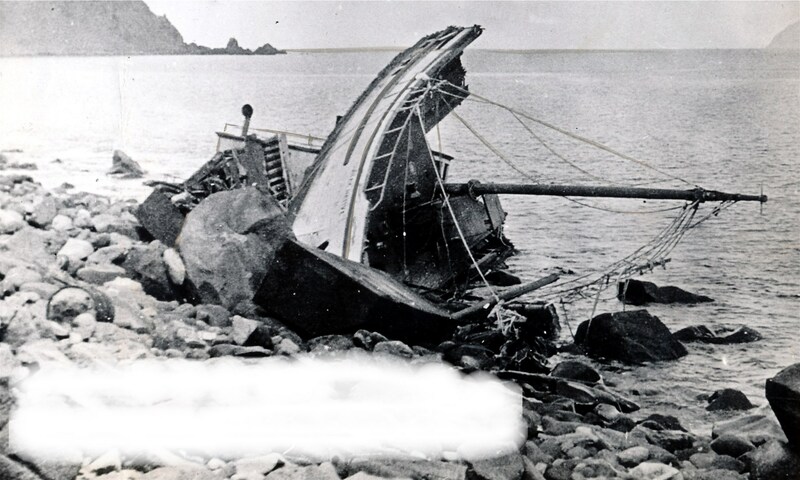 SWAN (1953) The 23 ton 44 foot wooden oil screw fishing vessel Swan burned May 17, 1953 off of Takanis Bay on the southeast end of Yakobi Island. I am looking for records of these losses but have not found them yet. I don’t have many Canadian sources of information. Thank You for posting. I will keep looking for the Blue Ocean and the Sea Ranger. There have to be many more Canadian vessels that were lost that were not recorded in the United States lists that I have used. I have found information on both of these wrecks and edited my publications accordingly. Thank you very much for drawing my attention to them. I have now posted information on over 3,700 Alaska Shipwrecks and will continue to fill in details.